What is the impact of the hydronic configuration on the performance of a hybrid heat production system? Graphic Name: What is the impact of the hydronic configuration on the performance of a hybrid heat production system? Primary Inputs: The inputs required to create this extended type of Load Duration Curve (LDC) are heat loads throughout a year of an hydronic heat production system with its different components. The loads can originate from both measurements and simulations. In this simulation-based case the yearly loads of three components were taken as input: a cogeneration device (CHP), a storage tank and an auxiliary boiler. 1) the total heat load of the building, which is the sum of the loads of the three components (CHP, tank and boiler), sorted in descending order = conventional LDC. 2) the heat loads of the three components separately, corresponding to the descending order of the total heat load. 3) the load duration curve of the CHP itself. 4) areas indicate total heat produced (or charged/discharged) by each component. 5) upper outputs are given for both the ‘expected’ behavior (i.e. what one can expect of a properly working installation) and the real ones for different design concepts. 6) in the graphs, three levels of load can be distinguished: peak, base and part load. Most people who design heating systems of buildings are familiar with a ‘load duration curve’: it is a common graphical representation of the heat demand of a building. But did you know that in the same graphic much more information can be shown, to indicate the performance of the heat production system in the blink of an eye? Especially when different heat production components are combined into a ‘hybrid heat production system’, this is beneficial. In the four schemes (upper part of figure), a hybrid production system with its possible designs of hydronic configurations are shown as an example. The first, ‘expected’, explains the heat flows in general and in the three following ones particular design options for the hydronic configuration are shown. In the lower part of the figure, the load duration curves including the loads of the three components are shown, corresponding to the upper schemes. This is the part of the figure that is automatically generated and is proposed here as ‘the fingerprint of a hybrid heat production system’. The x-axis shows the duration in hours and the y-axis the loads, relative to the maximum load of the building. In the reference results (‘expected’) three levels of heat load are distinguished, according to how an in-theory-proper-working installation would perform: -the base heat load is provided by the CHP -the heat demand higher than the CHPs load (dotted line=load duration curve of CHP itself) is covered by an auxiliary boiler - at heat demands of the building lower than the heat load of the CHP, two possible situations can occur. First, the CHP is on and the heat that is not consumed by the building is stored in the tank. Second, the CHP is off and the stored heat is discharged from the tank to heat the building. If the behaviour of the three hydronic configurations are compared with this expected behaviour, some conclusions can be drawn, such as: - for the ‘parallel basic’-configuration, a part of the base load is covered by the boiler instead of the CHP: the figure clearly shows that the hydronics fail, causing the CHP to operate less hours than expected. This configuration should be excluded from the possible designs. -for the two other hydronic configurations the tank can cover partially the base load, for which the CHP can produce more heat than expected. 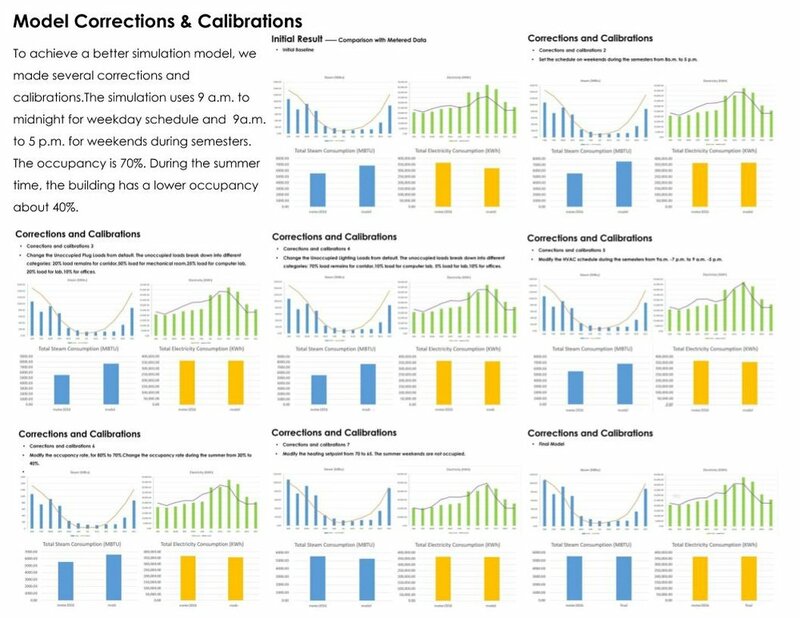 An algorithms post-processes the data of full year simulations. The total heat demand is calculated as the some of the loads of the three components, and that total demand is sorted in descending order. Then, the different loads are plotted as stacked areas. - How to evaluate hybrid heat production systems? - How should a CHP device be integrated in the heat production system of a building? - What is the effect of buffer tank volume on CHP operation? - How to ensure the priority of operation of the CHP above that of an auxiliary heater? This type of LDC shows how a particular hydronic configuration influences the operation of a heat production system. Because it is compared with an in-theory-proper-working installation, it enables to detect faults and benefits of the configuration. By creating these figures I learned about the disadvantages of each configuration, without necessarily looking into the detailed dynamic simulation data. Load Duration Curves (LDC) are widely used to communicate about the heat demand of a building. In this extended type of LDC, the load of each single heat-producing component is added, thereby providing much more insight. Indeed, not only the heat demand of the building can be seen, also the way this heat is delivered or stored is shown. Because LDCs as such are familiar, these graphics are easy accessible for both researchers and engineers working in the field of heating. In the end, designers or owners are interested in fuel consumption and the resulting costs, and not necessarily in heat as such. The relation between both are, of course, the efficiencies of all the components, which are not shown in these figures. Hence, extra graphics showing the efficiencies or fuel consumption would be interesting, especially to incorporate the effect of temperature levels in the installation. What is the impact of design elements on energy cost and LEED points? Graphic Name: What is the impact of design elements on energy cost and LEED points? These graphs show the impact of design elements added incrementally to an ASHRAE Standard 90.1-2007 baseline design, which is shown at the top. The left graph shows annual energy cost, and the right graph displays percent energy cost savings vs. the ASHRAE baseline. The graphic shows the designers the relative magnitude of savings contribution by design elements. The information helps when prioritizing where to focus effort in design development. The graphs are created in Excel, and they are combined and annotated in PowerPoint. How many LEED EAc1 points are achieved by the schematic design? Which elements of the schematic design contribute most to the energy savings? Prior to the analysis represented in this graphic, the design team spent significant effort identifying options for additional wall and roof insulation for this project in central California. This analysis helped focus efforts on lighting and daylighting and on kitchen ventilation. Showing design elements added incrementally helps to show a path to a savings goal. Could figure out a way to also present end-use energy consumption while remaining readable. What is the impact of Microgrids on Greenhouse Gas Emissions? Graphic Name: What is the impact of Microgrids on Greenhouse Gas Emissions? Step by step reduction in energy and carbon emissions as microgrid components are incrementally added for optimized operation. Charted numerical data output in excel. How can microgrids be optimized to achieve a carbon neutral operation? Assess optimal operating profiles for renewable energy generation, storage and reuse profiles to achieve carbon neutral operation. Series of design steps are explored and their impact presented in a single graphic. Vector graphics instead of raster images that resulted in a serious loss of resolution. What is the impact of glazing on energy and daylighting? Graphic Name: What's the impact of glazing specifications on peak loads and energy consumption? 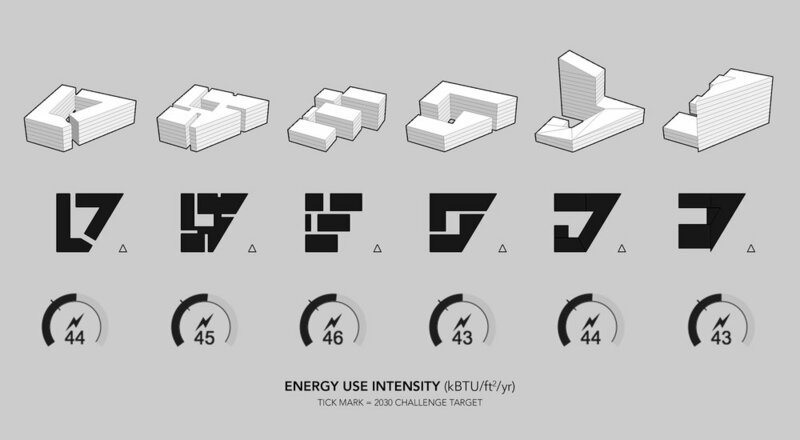 Primary Inputs: Room massing, interior furniture, exterior shading, window geometry, and SHGC. The graphic shows a dashboard like interface that shows a plan of the space with the sDA/ASE. Below the plan is an elevation of the exterior wall showing the configuration of the glazing and the amount of solar energy hitting the glass. Alongside the plan/elevation, there are several large metrics highlighting the impact of the glazing on the daylight and energy. There are indicators to the right of each metric that shows what is established as an industry standard for acceptable performance, or project specific goals for what is considered good/acceptable/poor performance. Elements were first modeled as individual spaces/rooms in Rhino then brought into Grasshopper and analyzed using Diva energy and daylight analysis. Since the Diva output data is saved locally to the users&#039; workstation, the Grasshopper script was set up to be able to run several analyses at once. After the analysis, the Diva data could be read off the workstation by Diva and processed with Grasshopper into the desired metrics. The graphic interface of Human UI, a plugin for Grasshopper, allows users to choose 2 specific options which are read by Grasshopper, processed, and graphically displayed via Human UI..
How do we balance energy and daylighting via manipulating the amount of glass and shading? How much glass is too much glass? What "Window to Wall Ratio" do we want? Does this external shade reduce glare? What glass type should we choose? What is the impact of frit on the glazing performance? What is good lighting energy? What is our target energy use for the space? How many chilled beams are required in this space? The architects were trying to design the façade of the building and wanted to know how much glass they could have in a space that provides a well daylit space while managing glare and solar gain. 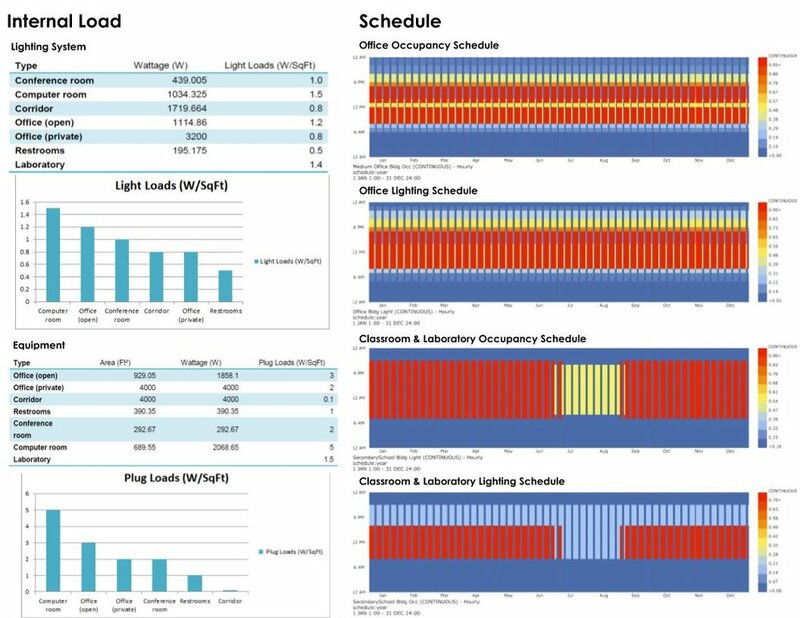 Using traditional outputs from daylighting and energy model tools, the team was having difficulty quickly determining what it meant to have good daylighting and what it meant to have good energy use. This is led us asking “How do we present our data/findings so that different team members (architects, electrical engineers, and mechanical engineers) can understand this data and can make design decisions from it as well.” The way that the Grasshopper + Human UI script worked, it saved an image to the server of each graphic automatically once it was displayed. These graphics were used in meetings to pull up multiple images of options side by side on the same screen like cards. This allowed for a quick literal side by side comparison of options. Ultimately these goals and being able to compare options helped decisions be made about shading, glazing configuration, and glass types for the final design of the building. Our graphic was successful in that we were able to convey a significant amount of information to our team, while maintaining a clean and easy to follow organization. It eliminated a lot of confusion and questions by the team and sped up the decision making process of the designers. The plan with our graphic is to continuously update based on the needs of whatever project we are using it on. With this being said, we would have liked to have a clearer naming directory for the various options we were analyzing. In our submitted graphic, the description of the option is all the information we have about the option, which resulted in a cryptic naming convention not easily understood by the team. We would have preferred to include a description of the option within the graphic but could not come up with a good solution to this problem since all the data is being read from Diva. We potentially could try to read and write data to another place, (eg: excel) to be able to use that as a place to store data that is not stored in the Diva results. Examples of data that could be stored are a written description of the option, information about shading, orientation data, or anything that the team/project deems useful for the project. We also think that the bar chart at the bottom could be cleaner, and more useful with labeling/colors/etc but used the stock Human UI chart component. What is the impact of climate and ubication on the energy balance of an initial model versus an optimized model of customer service agencies? Graphic Name: What is the impact of climate and ubication on the energy balance of an initial model versus an optimized model of customer service agencies? Other contributors or acknowledgements (optional) Sebastian Romero, Andrea Lobato-Cordero, Geovanna Villacreses and Cristian Espinosa. Instituto Nacional de Eficiencia Energética y Energías Renovables. Primary Inputs: Average per hour of meteorological information, geographical ubication, initial and optimized architectural models. Primary Outputs: Overall and hourly energy balance (gains-losses) for an extreme climate conditions day. This graphic shows how is the energy balance (loses and gains) established, for buildings that will work as customer service agencies, to be built in affected areas by the 2016 earthquake in Manabi, Ecuador. Firstly, a weather condition study was carried out by using data of a typical meteorological year of the cities were the building will be located (Pedernales, Manta, Flavio Alfaro, Portoviejo and Calceta). From this information, the most probable hottest day of all cities was selected (April 11th). An initial model (IM), offered by the contractor, was compared with an optimized model (OM) that uses passive strategies for design. The energy performance, from the simulation, of the building with its IM and OM was analyzed, always considering the building functioning requirement such as: space, distribution, usage, etc. The set strategies must be replicable and show energy savings in all the cities. The total energy balance showed in the donut charts indicates the characteristic thermal gains and loses throughout the building materials according to their type. Even though Manabi corresponds to the ASHRAE climatic zone known as “humid very hot” each one of the agencies shows a particular behavior in which the inner temperature increased at afternoon hours due to the typical weather conditions. As first result, the solar gains on windows and roofs are representative, this is why the usage of efficient windows and reflective paint on roof and walls, is proposed. The second result of the bar plot indicate he hourly behavior of loses-gains. The internal gains on external windows on afternoon hours can be relieved by accurately orientated vegetation. Besides, it is possible to note that, for loses, these are grater on ground floor, which is a cooling advantage. Finally, it is possible to conclude that in most cases, energy savings are found after passive strategies of design were implemented, on all four cities. Portoviejo city was a special case because heat loses were diminished. Firstly, with the coordinates of the five cities were the agencies will be place, through Meteonorm, the .epw (energy plus weather) files were generated, for the typical meteorological years (TPM) that will be used for weather study and energy simulation. With this data, the agencies were ubicated on ArcGis to confirm whether the cities are located on the same climate zone. Simultaneously, the weather study was carried out with Climate Consultant for each city. The day that showed the greater gains on the building was selected. The input data entered on Design Builder included: climate conditions, agencies characteristics IM and OM proposed. With the energy simulation, the hourly results of gains and loses were obtained, in .csv format. The analysis and calculations obtained were plotted as donut and bar charts by using Excel. The showed graphs were edited on Adobe Photoshop for a better display. After that, the final display was diagramed with the analisis content. - Which are the main energy gain and loss, as product of climate conditions, for a building model of customer service that will be built on affected areas by the earthquake in Ecuador? 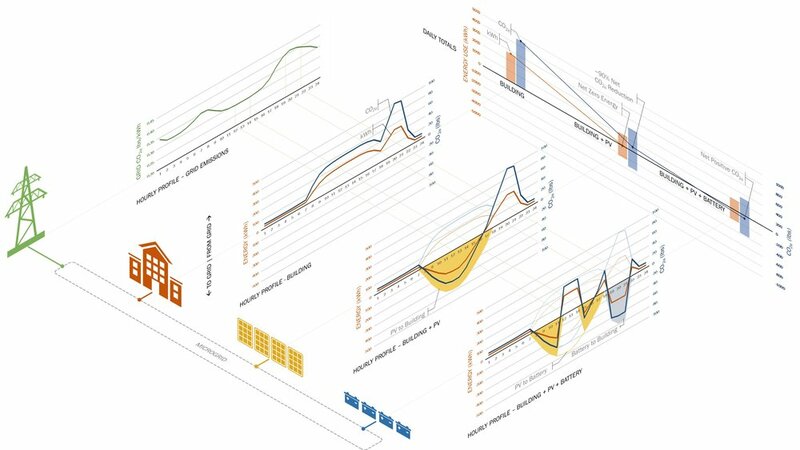 - How great is the energy saving that can be obtained by optimizing the initial model with the implementation of passive strategies for design, on the hottest day of the year? - How is the energy balance established and what aspects must be considered to optmize the IM? In Ecuador and other countries, it is proposed the construction of buildings with similar facilities and services to satisfy the customer demands. Besides, the buildings must be replicable in different locations. These buildings can be constituted by companies such as: banks, restaurant franchises, payment agencies, customer services, etc. Nevertheless, the influence of the energy and thermal behavior of the building is not considered. This is why it is important that prior the construction, efficient passive strategies on the design are analyzed and proposed, in order to obtain energy savings. The lessons learned were: though a climatic zone can be normalized (for instance, humid very hot), the characteristic weather of the area can affect differently each zone even if they are near to each other. 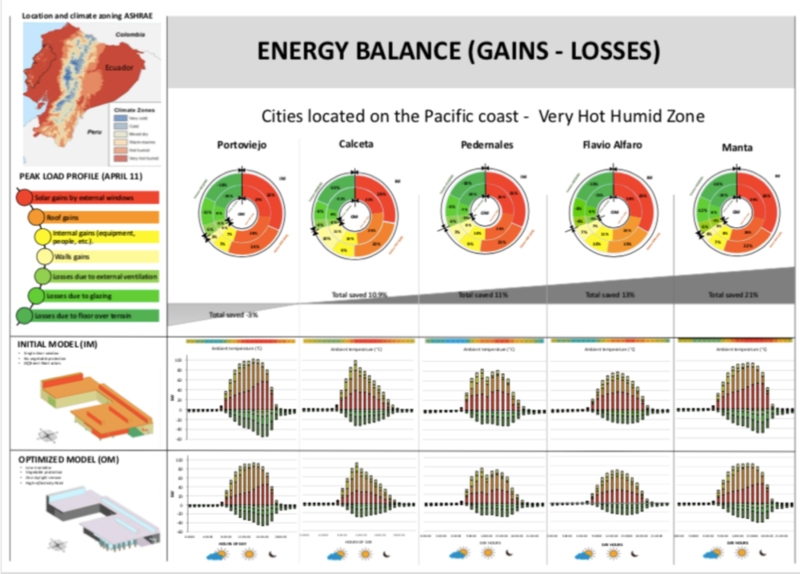 The energy balance is a simple and useful analysis that allows to detect and prioritize sensitive zones of the building to energy gain or lose. From the geographical location, the climate conditions and architectural characteristics of the building, it is possible to obtain the hourly and total energy balance, to detect energy saving opportunities in each city. In this case, it was observed that windows and roof are sensitive zones for heat gain, for this reason, their intervention must be prioritized to obtain greater energy savings. By using window and wall protection and specific paints (that do not increase considerably the final budget), effective energy savings can be obtained in all the agencies in the studied cities. Firstly, we will try to find a correlation between the geographical location of every building and the energy consumption, considering the meters above sea level in which the building is located. Also, we would like to try or to combine other passive strategies for instance: external ventilation and/or ventilation on floor over terrain. Furthermore, we will monitor the energy consumptions of the building before, during and after its construction, to corroborate implemented the design strategies. What percent of the day does the public space get exposed to direct sunlight? Graphic Name: What percent of the day does the public space get exposed to direct sunlight? This graphic displays a heat map of direct daylight, similar to overlaying a year&#039;s worth of shadow studies on one image. It is a simple method of showing which areas get more and less daylight throughout the year. Similar methods can be used to chop the year into seasons, time of day, or other more detailed analyses as needed. 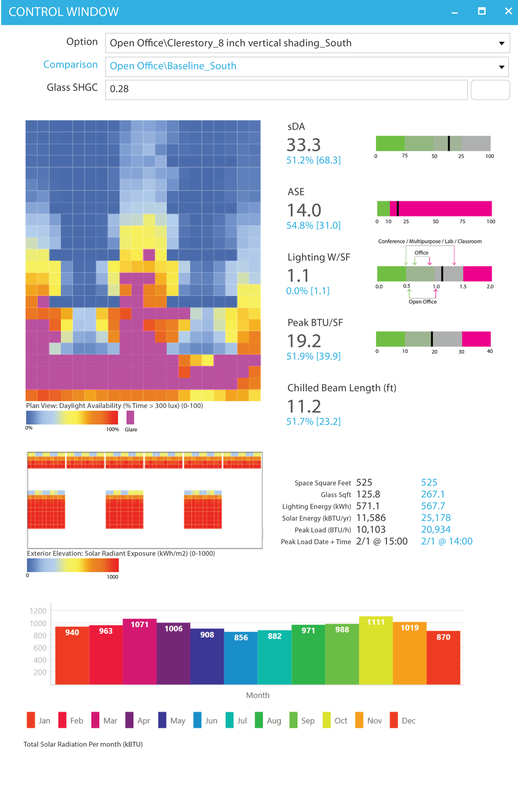 This graphic was created by manipulating the output data created while using Diva to run annual daylight analyses. Excel was used to divide the number of hours of direct daylight at each grid location by the number of hours of direct daylight received by a flat surface in this location. This information as then fed back into Diva to produce the graphic display of the site. What areas of the site are too dark? Which areas get lots of sunlight? Should the massing be adjusted to change these results? Are certain exterior programmatic pieces more suited to some areas than others? While laying out building massing and exterior program elements, it became necessary to analyze the brightest and darkest areas of the site. While a series of typical shadow studies displaying shading at various times of day and year would give an idea of the lighting levels, this graphic combines that information into a single visual. This allows a viewer to immediately understand the levels of sunlight throughout the site. It also allows designers to manipulate the massing in order to shift the results according to design constraints. This graphic is able to combine a year&#039;s worth of exterior daylighting data into a single graphic. It is easily decipherable by those outside the construction industry and can be used throughout the design process to inform massing decisions. It would be useful to make this a live graphic, such that any changes to the massing would be immediately reflected in the graphic. Daylight simulation constraints, as well as Diva for Grasshoppers interface, make this difficult to achieve. What are the impacts of interconnected design decisions on achievable performance levels? Graphic Name: What are the impacts of interconnected design decisions on achievable performance levels? 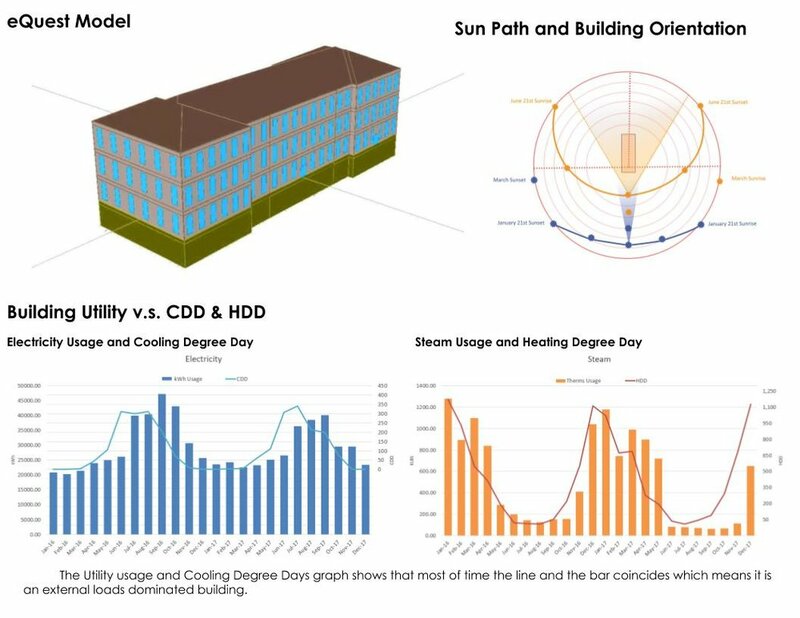 This graphic is intended to present schematic whole-building energy modeling results through a probabilistic lens. The graphic is in three parts, each of which steps out to a more generalized scale. The first part of the graphic describes the inputs for each parameter, which were bundled into “low,” “medium,” and “high” performance levels for envelope, HVAC, and interior loads. I would normally provide this in a table, but I wanted to create an illustration that tied the parameters visually to the building and make the numbers more meaningful. Each of these bundles were cross-referenced with the others to create a series of test cases. The second part of the graphic is a scatter plot presenting the range of resulting annual emissions if each bundle is held constant, so that the relative impact of each can be examined. For example, the first column of data represents all possible outcomes if a low-performing envelope system is selected. The third part is a frequency analysis distribution showing how many test cases fell within a certain range of annual emissions. The peaks show where the building’s performance level is likely to end up within the range of possible decisions assessed. Energy model results were extracted and post-processed in Excel, and the illustration was created in Photoshop. The goal was to confirm the building’s achievable performance level and understand which parameters needed attention in order to achieve those levels. My own goal was to reflect that in early analysis we’re really looking at a sample of possibilities, and to work with that ambiguity knowing that the design will shift over time. I was curious about how this work could be presented holistically and how that would differ from looking at ECMs individually. One surprising thing that I might have only noticed from the frequency analysis is that the building’s possible performance doesn’t have a linear relationship with the performance levels of the bundles. I generally expected that the more mid- and high-level bundles added the better, but in fact I found it was often more advantageous to have a balanced performance level across all three systems, which is why the graph’s peak is on the low end of the range rather than in the middle. The relationship between the scatter plot and frequency plot create an interesting dialogue—the scatter plot shows which areas reduce future risk or can always bring performance improvements, while the frequency plot shows that there are multiple pathways to almost every outcome. Having results which are cross-referenced across multiple disciplines also reinforces the need for an integrated design approach in order to achieve success. I would have liked to have find a way to identify the test cases that fall under each range for the frequency plot. It’s easy to do that in an interactive diagram where you can choose to limit or highlight particular cases, but on a static image there’s just not that much room. With more time and computational power, this approach could also be enhanced if individual ECMs were cross-referenced rather than bundles. What's the impact of glazing specifications on peak loads and energy consumption? The graph provides energy performance results for the full range of possible window properties at one time for a given climate, building type and orientation. Vertical and horizontal axes plot U-value and SHGC respectively, the most important window properties in energy performance. Gradient colors represent normalized total heating and cooling energy, and each plot represents one window type. Users can plot window products, using SHGC and U values on the graph to compare their respective performances. The colorstep value is 2 kBtu/ft2 [6.3 kWh/m2], meanings that window products falling in the same color area produce similar on-site normalized total cooling and heating results (i.e. within 2 kBtu/ft2 [6.3 kWh/m2]). Note: the heating and cooling values were produced from a full energy model of a perimeter zone. Thus, the values take into account the window, internal gains, and other comprehensive energy model inputs. The graph is the visualization from our proposed window selection tool. We’ve created 14 Grasshopper components for parametric simulation and data visualization, the code is written in C# using Visual Studio Platform. The workflow is as follows: 1. Conduct parametric simulation using self developed components and Grasshopper – Ladybug & Honeybee components. 2. Post process the data using self developed components. 3. Make screenshot from the tool visualization and further annotated the graph in Indesign. Choosing from the multitude of available fenestration products remains challenging. The existing window selection methods have limitations. We are proposing a new parametric workflow and visualization to better integrate with the early-design process. The graphic is part of our research for proposing a new workflow for window selection. We’ve researched the shortcomings of existing methods for selecting windows. We believe that the ability to visualize the impact of full range of window properties could be a beneficial aid to the early design process. A parametric simulation-based methodology was proposed. During the research, we’ve focused on exploring methods to simplify window system modelling and to increase simulation speed while maintaining desired accuracy. The graph allows the users to view the energy results of the entire set of window choices (assembly U-factor and solar heat gain coefficient) and immediately recognize trends in their energy performance. Users can also plot window products of interest on the graph to compare their respective performances. The tool visualization legend is automatically determined from the maximum result value and the minimum result value. The visualization does not provide the option to fix the legend ranges. It can create confusion when two graphs are put together for comparison.